To real estate assistance in the Okanagan, Shuswap, and Revelstoke areas. A local REALTOR® has the qualifications, experience and commitment needed to make your home sale or purchase a fulfilling experience. Selling or buying a home is a complex procedure that involves large sums of money, stringent legal requirements and has the potential for very costly mistakes. With a local REALTOR® at your side, you can navigate the real estate market with confidence knowing that you have a knowledgeable professional available to help you every step of the way. Buying a HomeIt doesn't have to be hard with a local REALTOR® at your side. Buying a home is never based on one specific factor; instead, it is a balance of many requirements - things like family size, location, income and lifestyle. REALTORS® are excellent sources of advice and assistance in these matters. Not only do they have the experience and knowledge to make sure the choice you make will be the right one, but they can also help you find the right property. Before you start your search for a new home, it is a good idea to first take a look at what you need, what you want and what you can afford. Whatever your taste and budget, there is a home out there for you. A REALTOR® can help make it easier for you to make the goal of home ownership become a reality. If you are interested in selling your home, consider the advantages of working with a REALTOR®. While the internet may give you access to real estate-related information, what it doesn’t offer is the knowledge, skill and experience to accurately interpret that information and understand the implications for the local market and your home, in particular. That’s where a REALTOR® comes in. After all, REALTORS® stay current on market values and trends with the ability to access the historical sales data of properties in your neighborhood and the knowledge and experience to properly price it to reflect current market conditions. 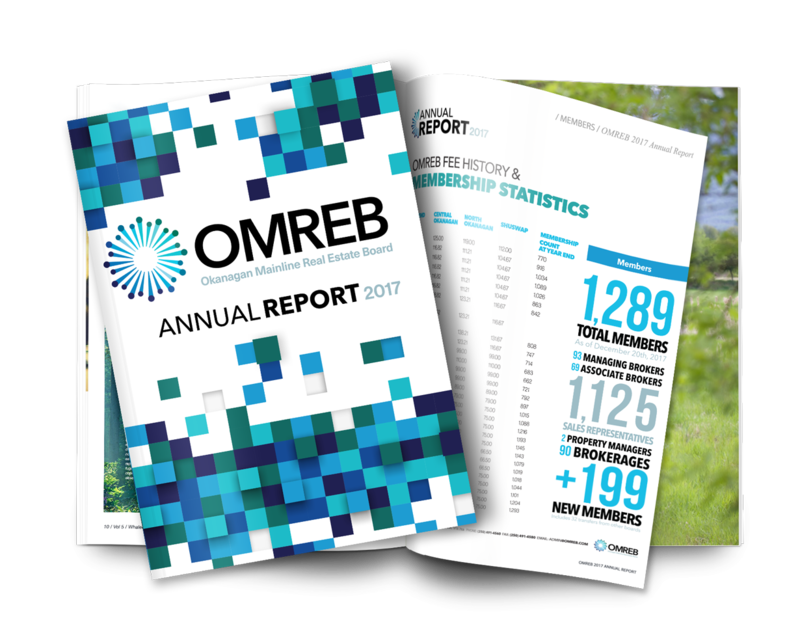 After putting substantive work "on hold" in 2016 leading up to the December amalgamation vote, OMREB hit the ground running this past year. Find out how it all turned out in the Okanagan Mainline Real Estate Board's 2017 Annual Report.